We are grateful to the Center for Socialist History for allowing us to share this out-of-print book with visitors to the FSM-A site. This material is coprighted by the Center for Socialist History. It can reproduced and distributed in any format provided that: the source and copyright are acknowleged; the distribution is free; and, the material is not reproduced in book, pamphlet or magazine article format without the permission of the Center for Socialist History. To learn more about Hal Draper, see visit the Hal Draper Internet Archive. 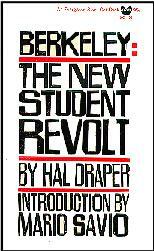 Note: We have digitized the text for the Forward, Mario Savio's Introduction, and the first 17 Chapters of Hal Draper's book. Mario's Introduction, the Forward, chapters 1 to 10, and chapters 11 to 17 are each on four separate Web pages. Each chapter is linked below to its specific location on a Web page. 1. "A New Generation of Students"
7. "What's Intellectual About Collecting Money?" 13. Whose Law and Order? We hope to finish the remaining chapters soon and would welcome volunteers to assist on this or with other documents from the archives. 19. Standoff on "Free Speech"
43. The "New Radicals" and the "Old Radicals"